City B&B praised as ‘best in world’ – The Argus January 18th 2012. Brighton is home to the top bed and breakfast in the world, according to a new report. 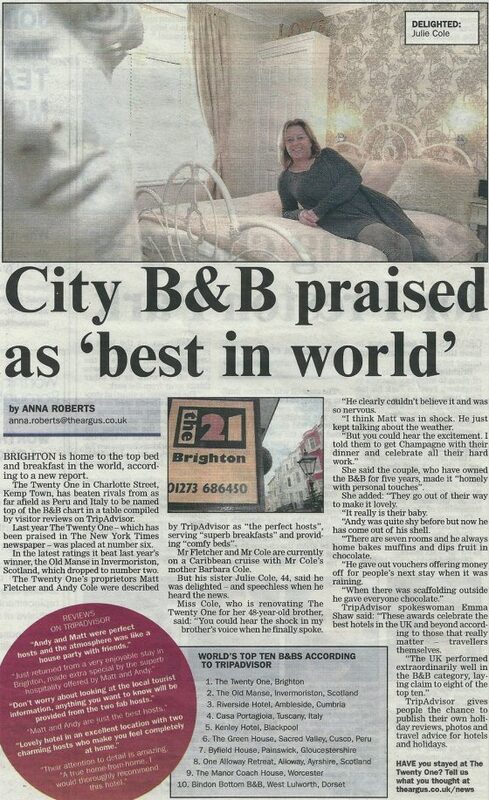 The Twenty One in Charlotte Street, Kemp Town, has beaten rivals from as far afield as Peru and Italy to be named top of the B&B chart in a table compiled by visitor reviews on TripAdvisor. Britain’s bed and breakfasts have a reputation for querulous hosts, poky tired rooms and nylon sheets, but – please sit down – they are actually the best in the world, according to Tripadvisor. The best bed & breakfast in the world does not, according to its owners, have towels that are any fluffier than the competition, or provide a breakfast that is anything other than resolutely traditional. But the free Tunnock’s teacakes probably help. 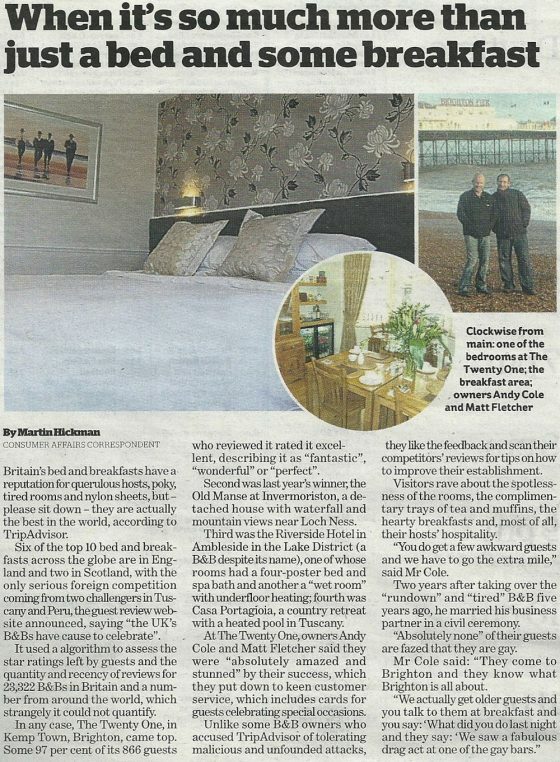 The Twenty One, a B&B in Brighton run by Matt Fletcher and Andy Cole is the world’s best in a list compiled by the travel website Tripadvisor. BRITAIN has the best B&Bs on Earth, according to tourists worldwide, it has been revealed. 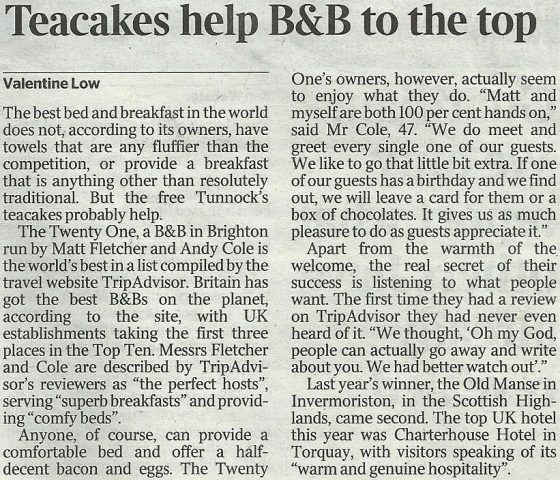 And not only that, but a local B&B has topped the Tripadvisor poll, beating stiff competition from establishments across the UK, to become the best in the world! 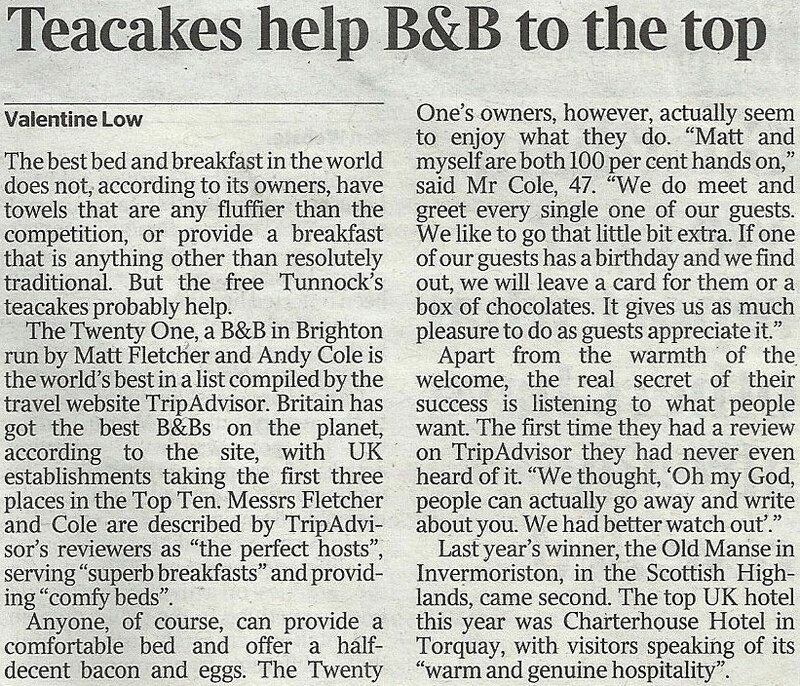 Number one for bed-and-breakfast accommodation was The Twenty One in Brighton, which climbed from sixth place last year to finish first this year.y Matt Fletcher and Andy Cole is the world’s best in a list compiled by the travel website Tripadvisor. BRITAIN has the best B&Bs in the world, says a global survey of tourists. 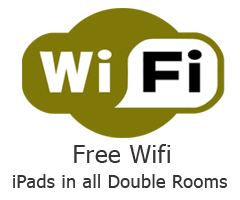 Eight out of a Top 10 compiled from reviews on website Tripadvisor are in the UK. No. 1 was The Twenty One in Brighton, which was praised for ‘perfect hosts, comfy beds and superb breakfasts’. 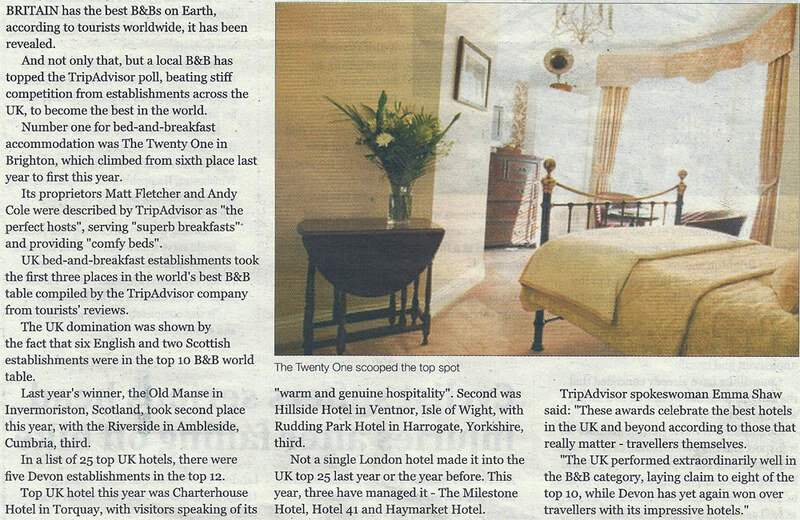 ENGLAND has the best B&Bs in the world according to independent travellers. The nation scooped five of the top 10 named in the Tripadvisor Choice Awards. 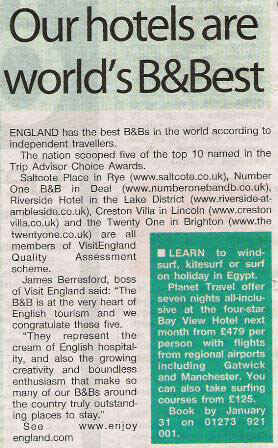 Saltcote Place in Rye, Number One B&B in Deal, Riverside Hotel in the Lake District, Creston Villa in Lincoln and The Twenty One in Brighton are all members of Visit Engand Quality Assessment Scheme.